The restaurant business is highly challenging and this is an irrefutable realism. Because, simply providing good food and reasonable price cannot anchor you for long in the dynamic industry such as hospitality. 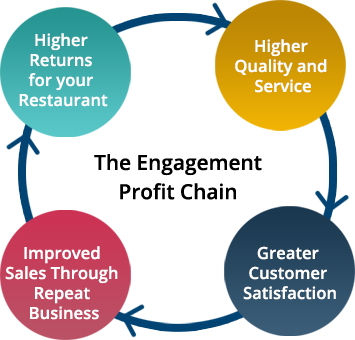 Each day, restaurateurs compete aggressively to retain good old customers; attract prospective customers; accommodate skyrocketing labor expenses; adapt to new technology; meet shifting food preferences and hire skilled resources that can keep the customer engaged. One of the critical elements, apart from value, quality, menu, touching on the restaurant marketplace today, is “Employee Engagement” that has a great potential to lead to better business outcomes. 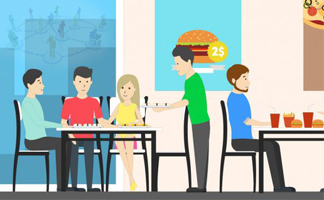 Therefore, retaining the right talent is the need of the hour for any restaurant. Why not when the company can gain 6% higher net profit margins through engaged workers. Leadership experts say that when the employees care for the organization, they will go the extra mile to contribute effectively to the company’s goals. In other words, they will offer their best service to customers and thus bring in repeat business; eventually leading to higher ROI. It is important for business owners to establish a productive, personal and long-term relationship with all their employees. This type of relationship can lead to emotionally committed employee, who will honestly work towards the overall success of your business. The other advantages include higher staff morale, work culture, lesser sick days and lower turnover. Retaining the right talent and reaping success is an art. Give a makeover to customer experience and drive huge brand loyalty through strategic employee engagement programs that are being followed by winning restaurant brands. However, employee engagement cannot be accomplished overnight. A good way to retain employee pool is to show them that you really care and value your employees’ contribution. Listen to them unbiased; allow them to chip in and express their thoughts, problems and creative side freely during team meetings or employee reviews. For those employees who shy away from sharing their ideas openly, encourage private discussions through suggestion boxes. However, if you are expecting their future involvement, then ensure to take their inputs seriously. At the same time, pay attention to what they are good at and utilize their skillsets to the fullest. Let your employees overhear about their growth. A positive feedback not only allows the employees to understand their respective progress but also inspires them to take a healthy approach towards their work and thus triggers speedy improvements. This way, employees are more likely to stay in your organization for a longer period. It is true that proposing a heavier pay check may hold an employee from looking for employment outside the organization. But if you cannot afford to offer increased remuneration, try proposing few additional perks. Because, not everyone works for money or promotion; there are employees who crave for greater job satisfaction and rewarding work environment that complements their talent. Hence, reward your employees’ ambition and creativity rightly; it will inevitably strengthen their loyalty towards the organization. Restaurants should also quickly adapt to the current trends in the industry such as new technology, clean menus, introducing locally grown produce, meal kits, refined customer service approach, etc. However, for such an initiative to get materialized the right way, employees need to understand the importance of being up to date and how the newly adopted business styles can add value to their work and overall goals of the organization. Therefore, allow your employees to showcase their best by providing them the required cross training and other development prospects. If corporate budget is a challenge, there are many small business alternative financing options such as the quick and easy Merchant Cash Advance program by Business Capital USA that can cover the additional training programs development, education and consultation expenses. Remember that employees cannot perform when they do not understand what they are doing, what they are expected to do and how to do. Therefore, obtaining additional working capital to finance and to enable employee advancement opportunities can be a worthwhile and profitable investment. Employee engagement is in a way directly proportional to the effectiveness of managers leading the team. A study by 2014 Global Workforce revealed that almost 72% of employees are exceedingly engaged when worked along inspiring leaders and managers. Hence, it is critical to hire passionate and forward-thinking leaders as managers that can inspire their team. Do not under estimate the importance of employee initiatives or support programs to achieve your customer service quality goals and maximize your revenue during the holiday season.